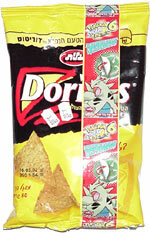 Taste test: Way back when in the '70s or early '80s, Doritos made regular tortilla chips. 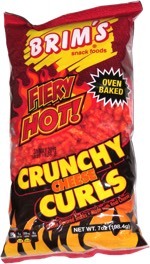 After Tostitos came about, I think Frito-Lay decided to end this flavor and concentrate on Tostitos. So these are basically the corn flavor, which taste like Tostitos, but in the Doritos shape and made with yellow corn as opposed to the white variety of Tostitos. These are good enough where you don't need salsa, but salsa would also go well with these. This snack was discovered by Amitai in Israel.